If you have weak knees, even thinking of exercising may seem counterintuitive. An arthritic knee or foot shouldn’t keep you from exercising. Right exercises for arthritis can actually lessen complications and pain associated with the disease. Exercises for foot and knee arthritis help restore joint’s full range of motion, strengthen muscles supporting the joint and increase flexibility. Walking is a low-impact activity that puts less strain on the knees. The activity helps strengthen muscles and build bones. Start out slow and pick speed. For best results, walk briskly for at least 30 minutes a day for five days a week. If you break it into three 10-minute sessions each day, it works just as well. 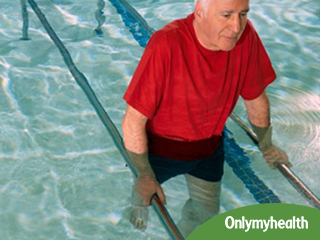 Walking in the shallow end of a pool is another easy exercise for knee arthritis. Water exercise is a good way to improve muscle strength and knee flexibility. Because the body is buoyant in water, you will have to work a little harder to move in it. Leg raises improve the strength of the quadriceps to strengthen your knees. To perform leg raises, lie flat on your back with your arms at your sides and toes up. Keeping your leg straight, slowly lift them off the ground. Now contract abdominals to push your lower back down. Hold the position for 2-3 seconds before you lower the legs in a controlled way. Do 3 sets of 5 reps.
As the name suggests, it stretches and strengthens your hamstrings. Lie on your back with both legs bent. Bring the legs towards your torso. Now link your hands behind your thigh and straighten your leg. Pull the straight leg back towards your head until you feel the stretch and hold there for 30 seconds before you bend your knee and lower your leg back to the floor. Stand with your feet shoulder-width apart and arms out in front. Bend your knees slowly until you’re in a half-sitting position. Hold the position for five seconds and make sure your back is upright. Slowly stand back up. A half-squat helps to strengthen thighs and gluteus to provide support to knees. It is thus, one of the best exercises for foot and knee arthritis. You might experience a slight discomfort during exercise, but it is normal. At any point, if you experience severe pain, swelling or stiffness, it is a signal to stop.